at the time of reporting the issue then it can help with a quicker diagnosis and fix. – go to …/Applications/Utilities/ in the Finder and launch Console. – (if necessary) click on the Show Log List at the top left corner of the window to display the logs that have been generated. – from the list, select FILES > ~/Library/Logs > CrashReporter. 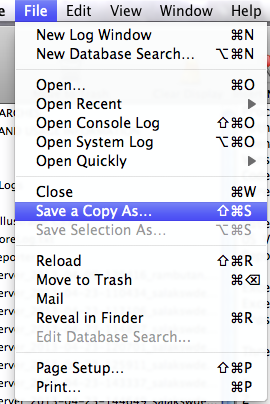 – select the log (or logs) corresponding to the time of the crash from the list, then select “Save a Copy As” from the File menu. – save the log and email it to support along with the Blackmagic/Megarip/Veripress Client and Server logs. This entry was posted in Blackmagic, Errors, Serendipity Client, Veripress. Bookmark the permalink.